A while back I posted about northern Nigeria's greatest female singer, Barmani Mai Choge. I devote today's post to Alhaji Mamman Shata, acclaimed as the greatest male singer of "Arewa," a giant who ruled the Hausa music scene for over 60 years. Finding out more information about Dr. Mamman Shata has not been easy. He is the subject of at least one biography, "Shata Ikon Allah!" by Ibrahim Sheme (Kaduna, Infomart Publishers, 2006), and at least one doctoral dissertation, “The Role of an Oral Singer in Hausa/Fulani Society: A Case Study of Mamman Shata," by Dr. Abdulkadir Dandatti (Folklore Institute, Indiana University, 1975), neither of which I've been able to get hold of. There does seem to be a fair amount of information about him online in Hausa. Shata was born in Rugar Kusa, Musawa Village, Northern Nigeria in 1922. Although his father disapproved of his interest in music, he began singing at the age of 13 and was soon composing his own Wakokin, traditional Hausa praise songs. 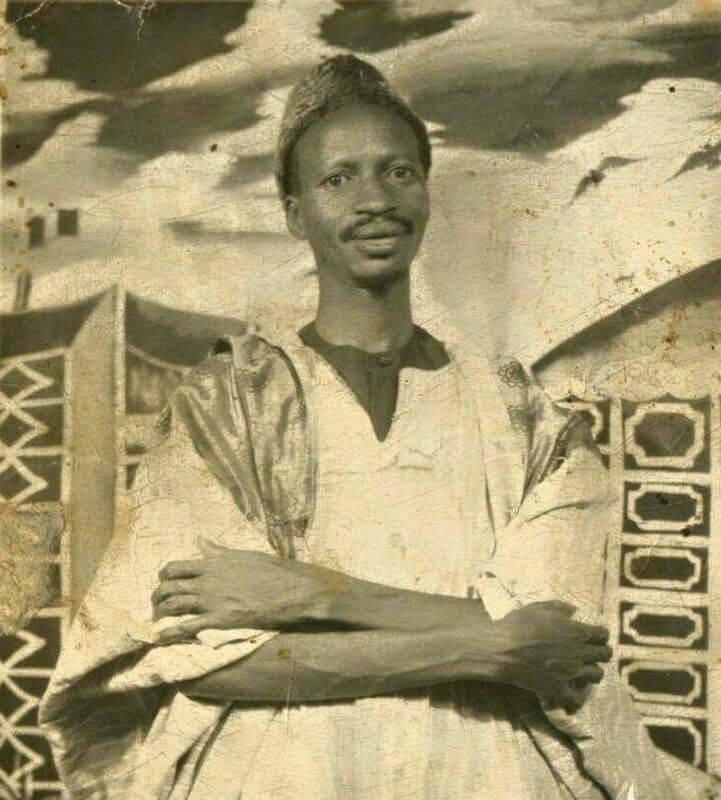 He was accompanied by musicians playing kalungu, small talking drums, and travelled throughout the north of Nigeria gaining fame if not yet fortune. He once told an interviewer, “I ventured into music out of childish exuberance. I didn’t inherit it from either of my parents. I sang for a long time without collecting a penny. Even when I was given money, other praise singers collected it. I only started collecting money when I made it (music) a career." He settled down in Funtua, also the home of Barmani Mai Choge, a wild and wooly municipality that hosted many brothels. Chafing at the strictures of conservative Hausa Muslim society, he had a taste for drink and sang its praises. It is said that Mamman Shata never rehearsed and composed his songs on the spot. I've been unable to track down much of his discography and I suspect most of his music was never pressed but recorded for broadcast. Probably much of it was not recorded at all. In addition to praise songs, his repertoire covered all manner of subjects, from agriculture to politics to the military, even food! One notable song is said to have been broadcast throughout northern Nigeria during the troubles of 1966-67 preaching peace, tolerance and national unity. He performed throughout West Africa and even made it to Britain and the United States. Alhaji Doctor Mamman Shata passed away on June 18, 1999, leaving behind three wives, 22 children, numerous grandchildren and an immortal musical legacy. The true voice of Arewa! 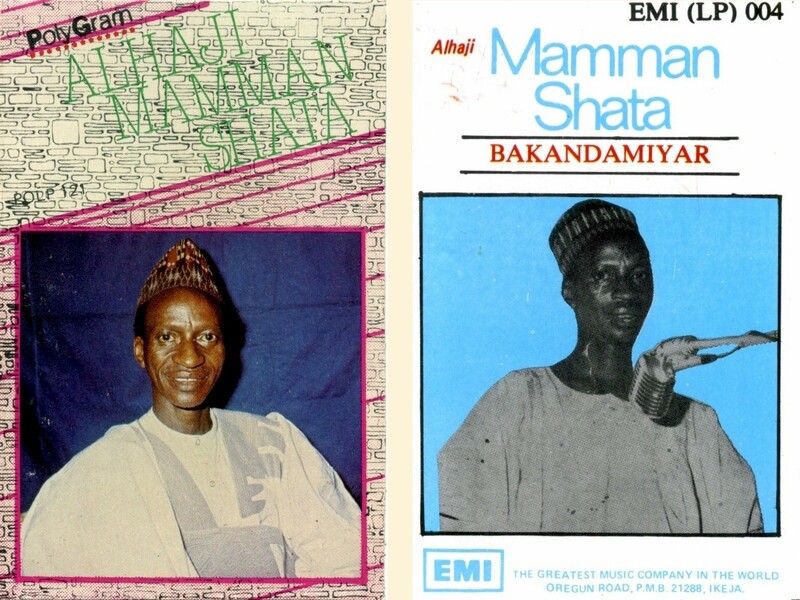 Here are two cassettes by the immortal Mamman Shata. Alo, Alo, the singer expresses his gratitude and so do the chorus. For drumming is your inheritance but not mine. Our Katsina, the city of Shehu. No doubt has lost many good things. And you also had missed my singing. And said, You have now felt the absence of Shata, the singer. I would have prepared for it. Play for money clothes to wear and a few pounds to get married. Download Bakandamiyar as a zipped file here. Download Emir of Hadeja as a zipped file here. The picture at the top of this post is from the Mamman Shata Facebook page. The translation of the lyrics of "Bakandamiyar" is from the article, "10 Years After his Death, Shata Still Lives on," from the Daily Trust (Nigeria), June 21, 2009, which provided much useful information for this post. I'm also greatly indebted to the blog Taskar Mamman Shata and the Wikipedia article "Mamman Shata."